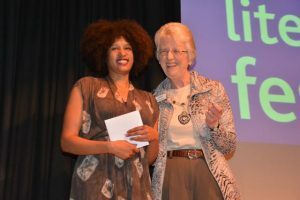 The 2014 award ceremony for the SI Leeds Literary Prize was hosted by Ilkley Literature Festival at the Ilkley Playhouse Wildman. A memorable evening, the event was hosted by Dawn Cameron of ILF and the Prize steering group, and featured writer and Prize Patron Dreda Say Mitchell in conversation with head of judges, Kerry Young. Gillian Tong, President of SI Leeds and Prize steering group member, introduced the 2014 award ceremony and thanked the Prize’s partners. 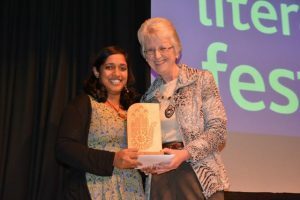 She paid tribute to our invaluable core support from Ilkley Literature Festival and Peepal Tree Press, plus in-kind support from key partners Arvon, The Literary Consultancy, New Writing North and others, who have provided such a great range of prize benefits for our winners and shortlisted writers. Dawn Cameron chaired a lively discussion between Prize patron and acclaimed crime novelist Dreda Say Mitchell and chair of judges, Kerry Young, in which the three discussed whether great writing comes from the margins, as 2014 Booker Prize winner Richard Flanagan suggested, and the dynamics of receiving criticism and feedback as a writer. All six shortlisted writers then read extracts of their entries, which were funny, tender, compelling and imaginative, and ably demonstrated both the range and real quality of writing from this year’s Prize. Extracts can be read here. Margaret Oldroyd, President of SIGBI (Soroptimist International of Great Britain and Ireland) articulated beautifully the synergy between the aims of Soroptimists and the Prize, and you can download and read a copy of her speech here. 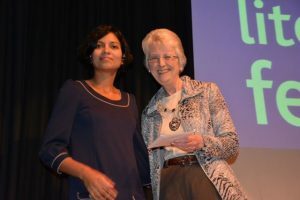 She introduced the SI Readers’ Choice award, representing the favourite shortlisted entry as chosen by some 20 Soroptimist members from across Yorkshire. The prize, a Kindle Fire donated by Bradford’s City Training Services, was awarded to Kit de Waal Blue in Green. 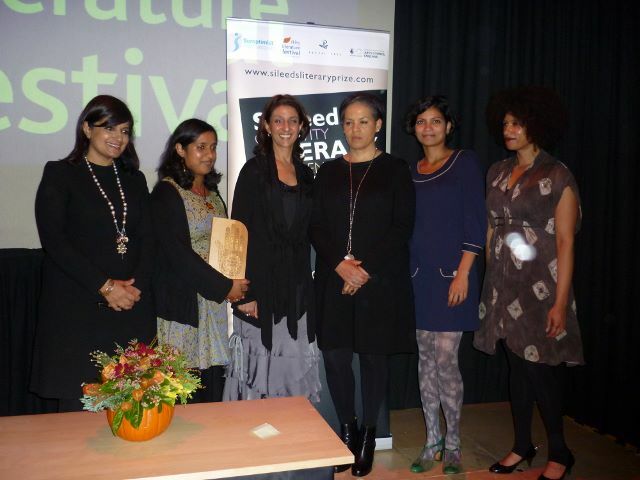 Mahsuda Snaith has written a great blog piece on her involvement with the Prize here. Please enjoy our gallery of images from the event – all images © Drew Wilby Photographics.